You are currently browsing articles tagged User guide. I have completed a Canon 7D e book user’s guide, Canon 7D Experience – The Still Photographer’s Guide to Operation and Image Creation that goes beyond the EOS 7D manual to help you learn when and why to use the various controls, features, and custom settings of this powerful camera, including the advanced and sophisticated autofocus system and Custom Function settings. Written in the clear and concise manner of all Full Stop guides, Canon 7D Experience can help you learn to use your Canon 7D quickly and competently, to consistently create the types of images you want to capture. This instant download Canon 7D book is for those who wish to take fuller advantage of the capabilities of their camera and to go beyond Auto and Program modes and shoot competently in Av and Tv modes. To get you started, it includes explanations and recommended settings for all Custom Functions, Menu settings, and Movie Mode settings of the 7D. Aimed towards intermediate photographers, it also covers basic dSLR camera functions and exposure concepts for those new to digital SLR photography, and explains more advanced camera controls and operation, such as taking control of the powerful autofocus system for sharp focus of still or moving subjects, using the various metering modes and exposure compensation for correct exposure of every image, and utilizing dramatic depth of field. This guide builds upon the information provided in the manual and explains essential settings and information to help you get out there shooting in the real world. Setting Up Your 7D – All of the EOS 7D Custom Function settings and Menu settings, including movie mode menus, with brief descriptions and recommended settings for practical, everyday use. These settings are a significant part of what makes the 7D such a unique and powerful camera. Set up and customize the advanced features to work best for the way you photograph. Auto Focusing Modes and Drive Modes – The 7D autofocus system is a revolutionary upgrade for Canon dSLR cameras, and taking control of it will enable you to successfully capture more action images. Learn the AF Modes and AF Area Modes, how they differ, how and when to use them to capture sharp images of both still and moving subjects. Also how and when to use focus lock and back-button focusing. Exposure Metering Modes of the Canon 7D – How they differ, how and when to use them for correct exposures in every situation. Also how to make use of exposure lock. Lenses – Explanation of Canon lenses and notations, and choosing your next lens. This digital guide to the Canon 7D is an 80 page, illustrated PDF document that expands upon the information found in the 7D manual, to help one begin to master their dSLR and learn to use the Canon 7D to its full capabilities. It is packed with helpful information applicable to the new and intermediate dSLR photographer – to begin to turn you into an advanced digital photographer! The iPad and iPhone version is available through iTunes or through the iBooks App on your iPhone/iPad. Essential Companion – Alas, a comprehensive and concise guide for hobbyists who desire to enhance their photography experiences. I highly recommend this guide to anyone who wants to get out of auto mode and learn how to take high-quality photos. It brilliantly explains how to apply advanced techniques and tips, walks you through the daunting task of menu settings, and smoothly guides you through the image-taking process. The instructions and explanations are easy to follow and well organized. The guide is a portable class on digital photography! A must-have if you want to learn how to use your camera to its fullest advantage. Best Guide to Using a T2i – I don’t know how I could fully take advantage of all the features the T2i has to offer without this publication! It’s well-organized, easy to understand, and succinct enough to keep your attention while still containing a wealth of information, tips and tricks to get the most out of your camera. I’m very happy that I found this guide. A very helpful and clear step-by-step guide: This e-book is a low cost worthwhile investment thanks to your expertise. My e-book user’s guide for the Nikon D5100, called Nikon D5100 Experience, is the best-selling, most popular guide to the camera currently available! How did I learn this? Because it is the only guide to the D5100 currently available! Through the flexibility of independent e-publishing, Nikon D5100 Experience is available months before any of the other guides for this dSLR are available. OK, so maybe one of the other ones is selling more in pre-orders – I have no way of knowing that. But for all the guides currently available…mine is on top! And is in the top spot for Kindle Hot New Releases in the Photo Equipment AND Photo Reference categories. And I’m quite proud of it. Even if it wasn’t the only one currently available, I still think it is the most helpful guide out there, explaining not only the features, controls, and functions of the camera, but more importantly when and why to use them in your photography. Want to become an affiliate and earn 25% commission for selling the PDF version of this e-book? See here for complete details on how to sign up as an affiliate and make money referring sales of Full Stop e-books on your blog or website! Looking for a Canon Rebel T2i / EOS 550D book to help you learn and begin to master your new dSLR? T2i Experience will help you learn how to use your digital SLR, quickly and competently, to create the types of images you want to capture. This camera is an advanced tool, and the guide explains how to use it to its full potential. Begin to take control of your camera, the image taking process, and the photos you create. This instant download eBook guide is for those who wish to get more out of their T2i / 550D, and go beyond Auto or Program mode and shoot in Av mode and Tv mode. While it explains basic dSLR camera functions and exposure concepts for those new to digital SLR photography, it concentrates on teaching more advanced camera controls and operation, such as using the various metering modes and exposure compensation for correct exposure of every image, controlling autofocus modes and focus points for sharp focus of still or moving subjects, and utilizing dramatic depth of field for professional looking photographs. Learning to get the most out of a dSLR can involve a steep learning curve, and I believe my book can help you speed up that process. -and a sample text page. See below for where to purchase. This version is in PDF format, text-only, 8.5″x11″, which can be read on your computer screen, printed on your printer, taken with you on your laptop, and can also be read on the iPad. The Kindle Edition of T2i Experience is also available, at Amazon.com and the Nook Edition is available at BarnesandNoble.com. 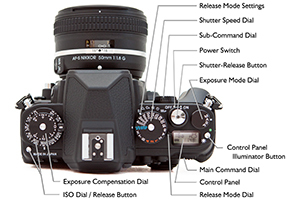 T2i Experience is a PDF guide that builds upon the information offered by the camera’s manual. In addition to covering the various settings, functions and controls of the Canon T2i / 550D, its lessons explain when and why to use them. It also describes every Menu setting and Custom Function setting, with recommended settings, including Movie Mode menus. Note that it focuses on still photography and not video except for a brief introduction to menus and important video settings to get you started. Setting Up Your T2i – All of the Menu settings and Custom Function settings, including movie mode menus, with brief descriptions and recommended settings for practical, everyday use. Set up and customize the advanced features of the T2i to work best for the way you photograph. Exposure Metering Modes – How they differ, how and when to use them for correct exposures in every situation. Also how to make use of exposure lock. This digital field guide to the Canon Rebel T2i / EOS 550D is a 48 page, PDF format text-only document, full of helpful information. It can also be purchased through PayPal on my website bookstore, Full Stop – good writing for better photography. Master your Canon T2i and learn to use it to its full capabilities! And if you have a Canon 60D, be sure to check out Your World 60D – The Still Photographer’s Guide to Operation and Image Creation with the Canon EOS 60D. My eBook user’s guide and tutorial on using the new Canon 60D, Your World 60D – The Still Photographer’s Guide to Operation and Image Creation is now available! Learn how to use the 60D, quickly and competently, to create the types of images you want to capture. The Canon 60D is an advanced tool, and this guide explains how to begin to use it to its full potential. You can preview it at the following link. The preview shows the Table of Contents and Introduction, a sample Menu Settings page, a sample Custom Functions Settings page, and a sample text page. Purchase Your World 60D through PayPal here! This version is in PDF format, 8.5″x11″, which can be read on your computer screen, printed on your printer, and can also be read on the iPad. The Kindle Edition is available at Amazon.com here and the Nook Version is available at BarnesandNoble.com. Begin to master your Canon 60D and learn to use it to its full capabilities! Looking for a Canon EOS 60D book or tutorial to help you learn and begin to master your new dSLR? I’ve written an eBook user’s guide for the Canon 60D, called Your World 60D – The Still Photographer’s Guide to Operation and Image Creation. Learn to use the Canon 60D quickly and competently, and improve your photography and capture better images. The 60D is an advanced tool, and this guide explains how to start to use it to its full potential. Begin to take control of your camera, the image taking process, and the photos you create. This instant download eBook guide is for those who wish to get more out of their 60D, and go beyond Auto or Program mode and shoot in Aperture Priority (Av) mode and Shutter Priority (Tv) mode. It covers basic dSLR camera functions and exposure concepts for those new to digital SLR photography, plus it also explains more advanced camera controls and operation, such as using the various metering modes and exposure compensation for correct exposure of every image, controlling autofocus modes and focus points for sharp focus of still or moving subjects, and creating dramatic depth of field for professional looking photographs. Learning to get the most out of a dSLR can involve a steep learning curve, and I believe my book can help you speed up that process. See below for how to purchase. You can preview Your World 60D at the following link. The preview shows the Table of Contents, Introduction, a sample Menu Settings page, a sample Custom Functions Settings page, and a sample text page. Your World 60D is a text-only PDF guide that builds upon the information offered by the camera’s manual and focuses on the essential functions and settings for real world 60D use. In addition to covering the various settings, functions and controls of the Canon 60D, its lessons explain when and why to use them. It also describes every Menu setting and Custom Function setting, with recommended settings, including Movie Mode menus. Note that it focuses on still photography and not video except for a brief introduction to menus and important video settings to get you started. Setting Up Your 60D – All of the Menu settings and Custom Function (C.Fn) settings, including movie mode menus, with brief descriptions and recommended settings for practical, everyday use. Set up and customize the advanced features of the 60D to work best for the way you photograph. This digital field guide to the Canon EOS 60D is a 40 page, PDF format text-only document, full of helpful information applicable to the new and intermediate dSLR photographer – to turn you into an advanced digital photographer! Begin to master your Canon 60D and start to use it to its full capabilities. Your World 60D was originally, briefly titled Real World 60D. It is the same eBook. If you use the Canon Rebel T2i/EOS 550D, or Canon Rebel T3i/EOS 600D have a look at my eBooks for those camera, T2i Experience and Canon T3i Experience.